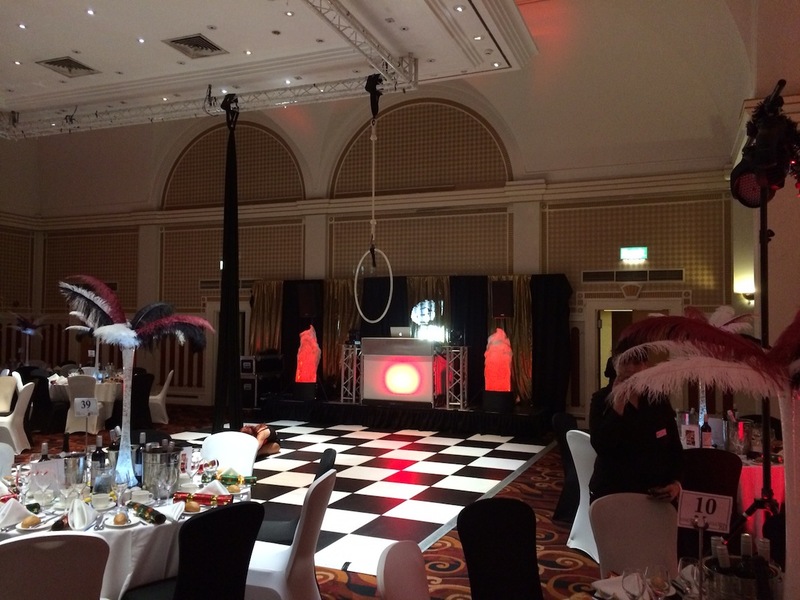 The whole team were really looking forward to this event as it was our first one at The Queens Hotel in Leeds. We arrived nice and early at 5:30pm to be setup for a 7:30 start. We were in the Ballroom, which has a capacity of 500 people, however had to drop the equipment off the previous night as there was a big conference on in the same room during the day. This meant the setup times were a bit tight as while we were trying to setup equipment the other company was busy de-rigging the conference. We got setup next to the stage in plenty of time and the room looked great. 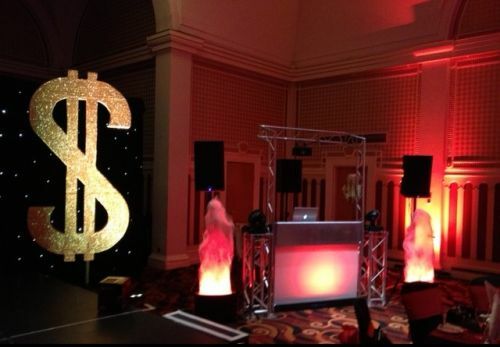 The theme for the evening was Las Vegas so we went with red LED Uplighting and a Starcloth Backdrop. 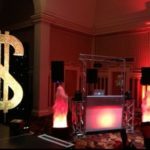 We used the Club Class package from our Wedding Disco range, featuring our Liteconsole and Moving Head lights. 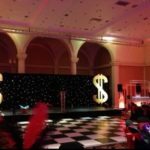 There was approximately 200 guests expected, all from key businesses in the city and it was a really important night for the hotel as they wanted to showcase the hotel to these prospective new clients. The meal got underway about 8pm after an opening speech from hotel manager who gave special mentions to some of the staff including a Porter who had worked there for 35 years! The Entertainment finally got started at 10pm with a Live Band on stage performing Jazz and Swing classics from Sinatra, Sammy Davis Jr and Buble. 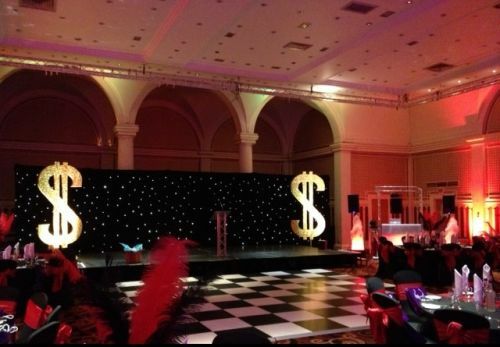 They also had a Fun Casino in the John Charles Suite. When 11pm arrived the band finished with Viva Las Vegas and everybody was getting itchy feet wanting to dance so we got the disco underway. From the first song people took to the Dancefloor immediately and we were inundated with requests, everything from Whitney Houston, Abba, Jessie J, Slayer, Guns and Roses, Robin Thicke, Human League and Gangnan Style… I would certainly say the requests were “eclectic” and covered pretty much every genre known to man! 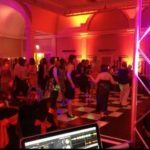 The disco was due to finish at midnight as most people would have had work the next day, however after we ended with the last song the crowd and even the hotel staff wanted more with one if the managers asking us to carry on until 12:45. So we fired the lights back up, and announced there would be more music which got a huge cheer. It was a great night, thanks to all the team at The Queens Hotel, Leeds and we will see you all soon! 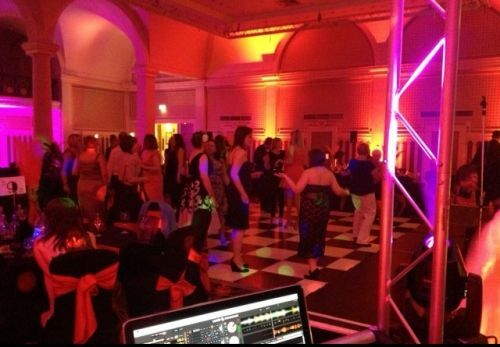 If you would like to speak to us about DJ Hire or a Wedding Disco please contact us today.